Compliance with the organic standards entails that operations have verifiable practices in place to avoid contact with GMOs. 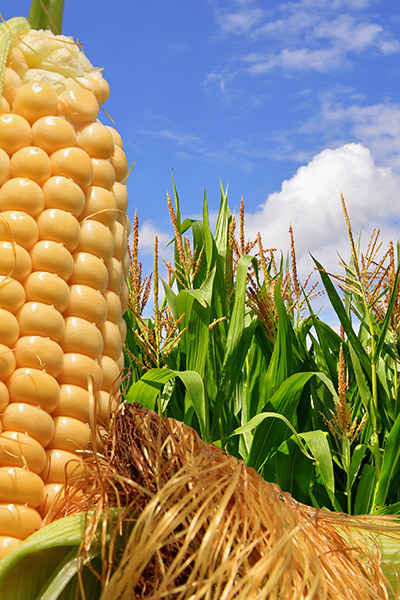 Since organic certification is process-based, presence of detectable GMO residues alone does not necessarily constitute a violation of the regulation. The NOP relies on organic certifiers and producers to determine preventative practices that would most effectively prevent contact with GMOs on an organic operation. The policy memo addresses frequently asked questions and will be incorporated in the next update of the NOP Program Handbook, scheduled for publication in the spring of 2011. USDA’s Animal and Plant Health Inspection Service (APHIS) has just announced the partial deregulation of Roundup Ready® sugar beets which will allow growers to plant them this spring. Attached is the APHIS announcement and details, including terms and conditions, of the decision. I will forward more information as it becomes available. The Cal-HIP Steering Committee held a quarterly meeting by conference call earlier this week to discuss proposals for the long term role and ultimate goals of the steering committee moving forward. Betsy Peterson is one of the charter members of the Steering Committee representing the California Seed Association, California State Floral Association and more recently the California Association of Nurseries and Garden Centers. The Steering Committee has been meeting for the last five years and a great deal has been accomplished by this group during that time. We discussed how we should move forward into the next phase of the program how that might change the role of the Steering Committee. it was deemed important that as PlantRight prepares to enter an implementation phase of the Weed Risk Assessment, (WRA) tool/Invasive-Free Certification program that the Steering Committee maintain structure and continue to meet on a regular basis. The group agreed that the Cal-HIP steering committee will continue to exist as an entity that represents the broader interests of the various stakeholder groups on critical decision points and to oversee the program. The Cal-HIP/PlantRight project manager will update and inform the Cal-HIP steering committee on the progress towards achieving our project goals via quarterly reports. The Committee will continue to meet quarterly with one in person meeting and three conference calls; in addition it was agreed that additional calls may be convened as needed. The Cal-HIP project manager will continue to engage with steering committee members for technical expertise or advice on an as-needed basis and in addition to seek assistance from outside technical experts and nursery industry leaders on an as-needed basis. Design and initiate the implementation of an Invasive-free Certification Program using the WRA tool, utilizing the Cal-HIP steering committee and Growers Working Group for technical input. Identify and secure short and long term funding for the Invasive-free Certification Program. Pursue partnerships with as many of the 50 priority grower and retailers as possible, refine the list as needed. Conduct a statistically significant, annual, and statewide retail nursery survey to measure metrics identified by Sustainable Conservation’s Board of Directors and Cal-HIP Steering Committee. Update content on PlantRight website; build site capacity for nursery survey volunteers and WRA program. We welcome the input from growers during the process of designing and implementing the Invasive–free Certification Program. If you are interested please contact Betsy Peterson at bpeterson@cgfa.org to learn more about how you can participate. On April 19, the National Organic Program (NOP) issued clarification on the use of green waste and green waste compost produced from approved feedstocks in organic production systems. It reiterates NOP support of the use of composted plant and animal materials to maintain or improve soil organic matter, as supported by the regulations. The guidance clarifies what can comprise compost allowable in organic production systems, including approved feedstocks, and addresses the issue of residual pesticide levels that can be present in green waste and green waste compost. The a pdf of the guidance document (NOP 5016) is attached. If you are responsible for labeling any seed that is chemically treated make sure that you are following the regulations as defined in the Federal Seed Act, (FSA). The FSA has very specific labeling requirements for labeling treated seed. The definition that the FSA uses for treated seed: Act Section 101(23); The term “treated” means given an application of a substance or subjected to a process designated to reduce, control, or repel disease organisms or other pest, which attack seeds or seedlings growing there from. At the Vegetable Seed Committee meeting Betsy reported on the progress that has been made on mitigation efforts for Verticillium dahliae and Leafy Greens. A copy of the Information Sheet was included in the packet along with the presentation that was made to the CLGRB in June. She reported that a Section 18 has been submitted to CDPR for use of Mertect 340F as a seed treatment on spinach seed. Mertect has been identified in efficacy trials at WSU by Lindsey DuToit as having good efficacy against Verticillium Wilt. This Section 18 is more complex then any previous submission as it is a product that will be applied to spinach seed which is not impacted by Verticillium but will serve to protect the subsequent iceberg lettuce crops from Verticillium inoculum in the soils. The emergency we are claiming is the potential loss of Iceberg lettuce production in Monterey and Santa Cruz counties that represents 60% of the US production due to levels of Verticillium for which spinach seed is one of the potential sources of inoculum. A Section 18 application requires that a justification be made of the emergency through economics and that the emergency is not a chronic circumstance. Following several meetings with CDPR and US EPA to determine the best method to state the emergency need, a document was drafted and circulated among several technical advisors for their inputs and comments this summer. The final draft of the justification was submitted to CDPR on September 16 for review by CDPR. During the CSA MY meeting Betsy received word from CDPR with feedback on the submission that they had received from US EPA. Three areas needed clarification/additional information, the use of fumigation, documentation of the increase in levels of Verticillium and residue information. Betsy responded to CDPR with the requested information and we are waiting on word from CDPR. At the CLGRB Research MY Meeting earlier this week a discussion about the status of Vertcillium Wilt ensued and we learned that 33 additional fields have been identified that have inoculum levels high enough that lettuce cannot be produced in them. There is continued research on Verticillium in the areas of seed transmission and soil inoculum densities and several other issues. Links to copies of the written report from Krishna Subbarao, the Verticillium dahliae Information Sheet and the presentation made to the June CLGRB can be found on the CSA website which you are encouraged to read for more detailed information. Of note CDFA provided feedback this week on the Block Grant proposals that were submitted last April but not accepted. Betsy had submitted a proposal to fund additional seed related research on the Verticillium issue but was turned down. The feedback received this week indicated that whereas the criteria was met with no need for improvement that there was simply not enough money to support all of the projects that were proposed. The 2010 call for proposals will be announced soon and we have been encouraged to participate in the next round of funding. Sacramento, Ca (May 20, 2009). 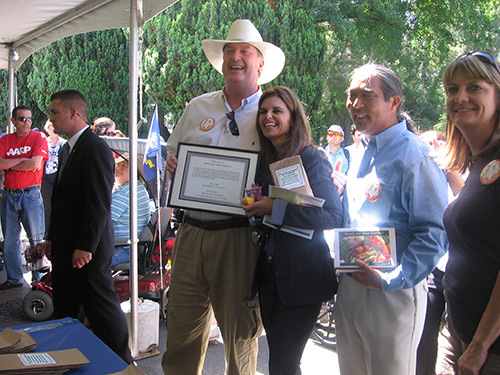 On Thursday, May 21, 2009, California agriculture trade associations joined First Lady Maria Shriver at the “WE Garden in Capitol Park”, for the planting of the first edible garden in the California State Capitol Park. The California Seed Association, along with the California Association of Wheat Growers, California Bean Shippers Association, California Grain and Feed Association, and the California State Floral Association provided materials for the garden planting and helped visiting schoolchildren understand the relationship between seeds in the ground and food on the table. Association volunteers will also help students plant their own lima bean seeds to take home. 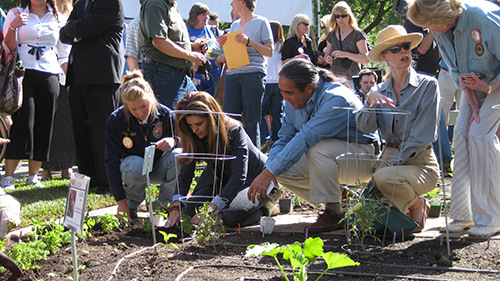 The new garden is designed to teach children, students and visitors about the importance of agriculture in providing nutritious food to the state and the world. From the farm to the table, California agriculture plays a crucial role in the state’s economy and food supply. Education is the key to consumer awareness about where their food comes from and how important it is that we have a reliable and safe food supply. Goldsmith Seeds, Kirsten Company LLC, MorningSun Herb Farm, Seminis a division of Monsanto and Seeds by Design all contributed products to ensure the success of the event. The California Seed Association has committed to providing all the seed for future plantings at the WE Garden in Capitol Park. The guide is available free for anyone to download and print click: "Manager's Guide To Safe Trucking During Agricultural Planting and Harvest Season"
CSA received the final 24(c) label for Beleaf 50 SG Insecticide, (a.i. flonicamid), alfalfa grown for seed for control of Aphids and Lygus Bug on October 23, 2008. CSA is the third party registrant for this registration that is effective immediately with no date of expiration. As always, when using any pesticide product, please be sure to follow the label instructions and for use of Beleaf be sure to have a copy of the label in the possession of the user at time of application. A copy of the 24 (c) label can be linked here. Thank you to ISK BioSciences Corporation and FMC for providing this important tool for our alfalfa seed producers.